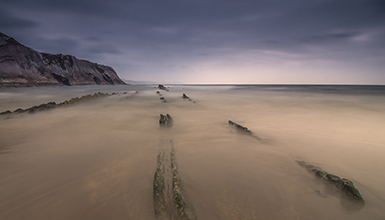 Located on the coast of Zumaia, Itzurun Beach is one of the most spectacular areas. Its huge and the vertical cliffs and the limestone walls that reach the 150 metres of slope will attract visitors, where they will be able to admire a geological phenomena called flysch caused by the erosion of the sea throughout the years. Itzurun Beach is 270 metres long, and has golden sand and heavy swell. 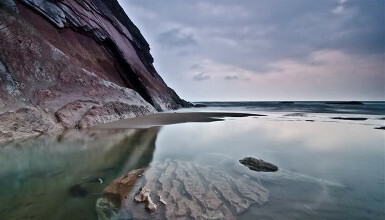 It is located close to the urban area of Zumaia. Water sports lovers will have the chance to practise different activities, such as surfing, canoeing or bodyboarding. 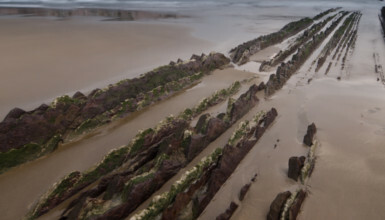 There are right-hand and left-hand waves that vary depending on the tides. The western part of San Telmo Beach requires a higher level of skill because of its sand and rock bottom. At high tide here a wave forms close to the shore that bounces off the cliff and creates excellent ramps for bodyboarders. There is a bar where meals are offered in summertime. A few metres further visitors will find a seawater therapy centre with unbelievable views. Lifeguard service: 10:30am - 7:30pm.